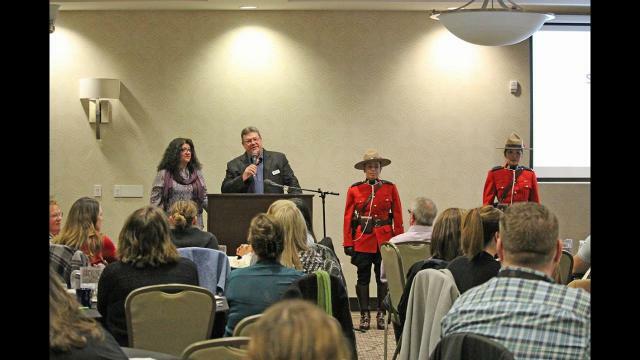 The 2017 recipients of Central Alberta’s domestic violence Frontline Service Providers’ Awards were announced this week at a luncheon hosted by the Central Alberta Domestic & Relationship Violence Initiative Committee (DRVIC). The Awards, held annually since 2005, celebrate and recognize employees who have made a significant contribution by working directly with individuals and families impacted by domestic violence and bullying. The awards saw 18 nominations submitted for the awards in three categories including Frontline Service Providers’ Award, Lifetime Achievement Award and the Patrick Dillon Leadership Award. The Lifetime Achievement Award, recognizing a frontline employee who has made a significant difference for a minimum of 10 years to individuals and families impacted by domestic violence and bullying was awarded to Kim Haugen of the Domestic Violence Intervention & Response Team (DVIRT). “I’m very honoured,” said Haugen about receiving the award. The Outreach Centre is her employer, but she’s housed in the Domestic Violence Unit in the RCMP. “I mainly deal with calls for service from the police that are domestic violence related, so we support the clients by providing domestic violence education and information,” she said. She said they have case workers at The Outreach Centre and case workers in the detachment, and said Outreach caseworkers will deal with rural files, walk-ins or agency referrals. She added they also attend the courthouse quite often for applications of protection orders, or to attend a trial to show support to the victim. Haugen said what keeps her coming back is that she loves her job. “It’s a great privilege for me to be able to assist somebody to escape domestic violence and to move on and have a healthy safe environment,” she said. Haugen started off with Victim Services a few years ago in Innisfail, and from there moved on to the Women’s Shelter in Red Deer. She began with The Outreach Centre about six years ago. In terms of the situation this year on domestic violence, Haugen said they still have lots of files, lots of people reporting and lots of women coming forward. At the luncheon, people also heard from Vince Morelli of SafeTracks GPS Canada. He spoke about advanced SPS Personal Locator Devices, which are used for monitoring at risk individuals. Haugen said she is onboard with getting the bracelet system back. “It was a wonderful program. It was very unfortunate that it ended,” she said. The other award, the Patrick Dillon Leadership Award, which was for outstanding contributions and leadership on an ongoing basis by a senior manager or agency director in the field of domestic violence and bullying, was awarded to Jim Freeman, founder of J. Freeman Psychotherapy Ltd. Freeman spent decades developing treatment services for perpetrators and victims of domestic violence. The Frontline Service Providers’ Awards recognize the dedicated and hardworking men and women on the front lines who are providing services to individuals and families impacted by domestic violence and bullying. Recipients are selected based on how they work collaboratively with colleagues and the community, and how they exemplify creativity, initiative and innovation, as well as demonstrating the attributes of positive role models. For 2017, two recipients were selected. Samantha Chartrand of The Outreach Centre Julietta’s Place, and Lauren Davies from Alberta Justice & Solicitor General Community Corrections.